Harvests in 2007-2012 from the dug and undug experimental beds at Lower Farm, Somerset, UK. The four beds of 1.5×2.5m (5×8′) were created in March 2007 from old pasture on clay soil, and the first section below is a record of their total harvests over six years. Below that are tables of the harvests in 2011 and 2012. In their sixth year without any soil disturbance, the two undug beds have performed better than ever. This experiment has now finished as I have moved from Lower Farm, and am running a new one at Homeacres. 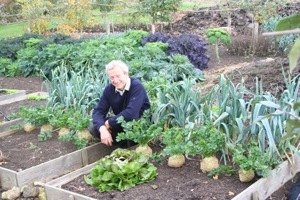 Each November or December, as soon as the last harvest is taken, I spread a large wheelbarrow load of compost or manure (two inch depth or 5cm) on the two undug beds and I dig the other two, at the same time as incorporating an equal amount of compost or manure at the bottom of 15-20cm (6-8′) spits*. The idea is to have two pairs of beds with the same ingredients, but in a different profile – also one of the beds has undisturbed soil, one has disturbed soil. In November 2008, beds 1 and 2 (undug and dug respectively) received home made compost while beds 3 and 4 received horse manure from the neighbour’s well rotted pile. In November 2009, beds 1 & 2 received well rotted cow manure – purchased from a neighbouring farm and checked for aminopyralids by doing a germination test – while beds 3 and 4 received home made compost. 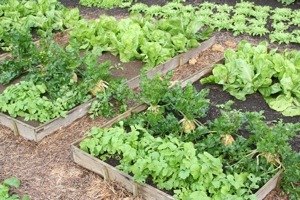 In November 2010, beds 1 & 2 received home made compost, beds 3 & 4 received cow manure. In November 2011, vice versa again. The data here is of harvests weighed, trimmed and graded to my normal standard for selling produce. I also append some comments on any problems encountered and on quality of growth. 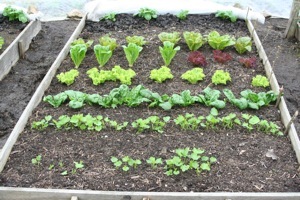 All beds carry a mixture of single and double crops, so there is rarely any empty space in the growing season. Plants are raised in my greenhouse in modules filled with organic multipurpose compost from West Riding Organics. *My digging method (single dig) is to put the first spit of soil into a wheelbarrow, from a 25cm (10’) row across one end of the bed to be dug, then manure or compost is placed in this first trench before soil from making a second trench is put on top of it. The barrow of soil is used at the end to fill the final trench and the whole process takes just under two hours. 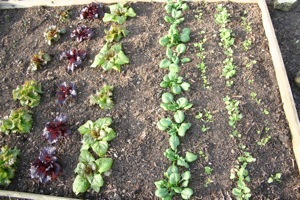 * Early harvests are beetroot, chard, lettuce, onion, peas, potatoes, radish and spinach. Late harvests are all other vegetables listed here. The last two columns show how the no dig beds start growing more quickly in spring, followed by the dug beds catching up somewhat in late summer and autumn. There are differences between both dug and undug, and between 2011 and 2012: notice the lower yields in 2012 when the incessant rain had more impact on dug soil, from what I can see here and from the comments of other gardeners. Undug soil preserves its structure in wet conditions, and also can be accessed more easily as it does not damage from being walked on. Summing up, less good weather in 2012, lower yields, most noticeably on the dug beds which have suffered most with a 28% reduction compared to a 19% reduction on the undug beds. Root vegetables all better on the undug, except for parsnip and that is a puzzle as in 2011 it was the other way around. These results are indications of the enduring validity of a no dig approach, and highlight some intriguing variations for each vegetable. 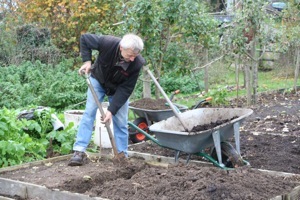 November 2011, digging one of the dug beds, adding compost to trenches. 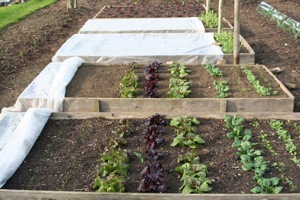 Beds were sown with parsnips and radish in late February, planted with spinach, lettuce, potato, onion, beetroot, cabbage and tall peas in mid March, with carrots sown too. Then all four beds were covered with fleece, and the three photos below show what was happening under this fleece by early April. Dug bed on right, all sown/planted same day. Harvests already of 1.7kg lettuce, spinach radish from Dug and 2.4kg from undug, both lettuce & radish higher yielding on latter. Through large parts of April, early May, June and the first half of July, the area as a whole was something of a quagmire, the paths running with water on some days, thank goodness for raised beds! Harvests have been steady off both dug and undug beds, and yesterday I even pulled the first beetroot, by carefully twisting out the largest root from four of the five clumps on each bed. 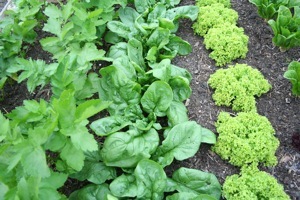 The most notably different harvests have been of spinach, which is much stronger and darker on the undug bed, and of cabbage which was more hearted on the dug bed. Presumably this is related to their different rooting habits, and I have heard that brassicas use no fugal mycorhizae to grow their roots, and digging destroys many soil fungi, so this would make sense – the spinach presumably does use mycorhizae. RADISH, April harvests of 0.42kg dug bed, 0.62kg undug bed: less slug damage to undug radish. The lettuce are still cropping and I have planted kale between. Undug bed is in front, dug bed behind. 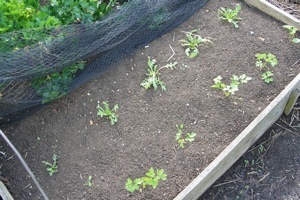 I have planted endives where the beetroot just finished. Undug bed is in front, dug bed behind. In mid July we had a particularly heavy storm, water in all pathways. Undug bed is on the right. By 25th the onions were ready to pull after some welcome sunshine. Undug bed is on the right. This table shows harvests off both pairs of beds up to end August. I am about to start harvesting french beans and kale, with more endive and salad to follow, then parsnip and celeriac in late autumn. Growth continues to look healthier on the undug beds, assess it for yourself in these four photos, all taken on 29th August. Dug bed. French beans after potato, kale after lettuce, all planted early July. Undug bed. 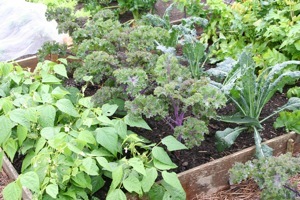 French beans after potato, kale after lettuce, all planted early July. Many slugs have been chopped! Undug bed. 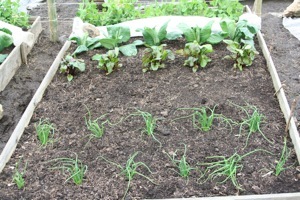 Other end of same beds, after onions there is wild rocket and parsley, planted13th August. Dug bed. 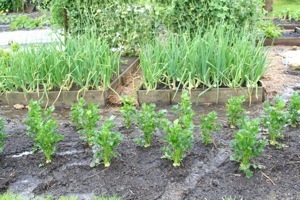 Other end of same beds, after onions there is wild rocket and parsley, planted13th August. 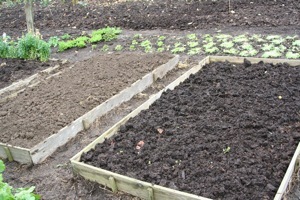 Compare the surface in late November of an undug bed, still soft and dark. Dug bed where the pale clay is on top. The celeriac were harvested late October and although looking nice, they turned out to have many slug holes with woodlice too. 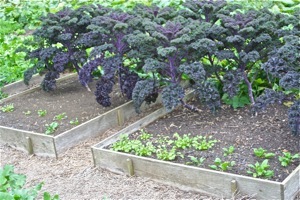 Whereas the same plants grown in beds without wooden sides had almost no damage, so that is an interesting result too! The four beds on 9th April 2011 after rolling fleece back on the top two, a closer look below: the dug spinach is slower with more slug damage and parsnips are less abundant. Dug Bed. 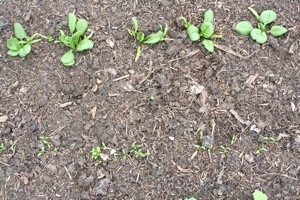 Lettuce & spinach planted mid March, parsnip & radish sown mid Feb. Through April and May growth was steady in above average temperatures, and I watered all the beds about once a week. 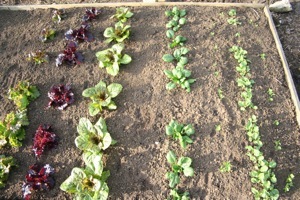 Lettuce and spinach are being picked weekly, potatoes and beetroot are almost ready and peas are flowering. Carrots have germinated better on the undug bed, I think there were more slugs on the smooth clay surface of the dug bed. 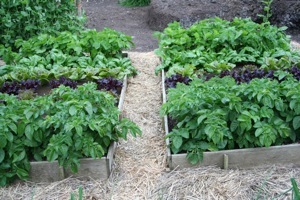 Beds 1 & 2, potato plants hiding the carrots, parsnips far end. 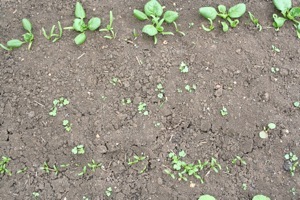 1 & 2: dug bed on left, purslane & spinach are more eaten. 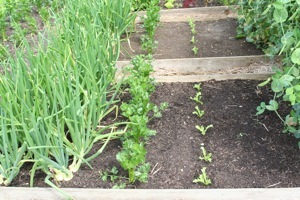 On the other hand the dug bed’s celeriac is bigger and the chicories are showing more heart! 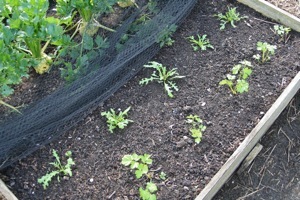 Whereas the winter radish in front has grown more strongly on the undug bed. 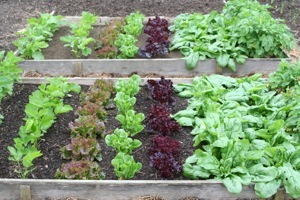 Lettuce was similar, dug lost plants to slugs and replacements were higher yielding variety! All beds were fleeced 22 March – 20 April. All first sowings and plantings complete by late March and beds were covered with fleece for one month. Worse slug damage on the dug soil as slugs prefer the clay surface to lumps of less smooth compost. 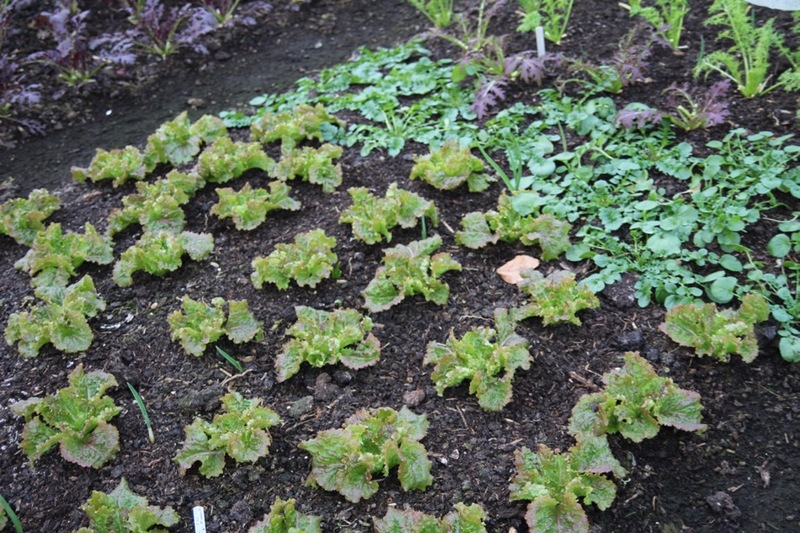 More lettuce replaced on dug bed in early April. Second plantings in July & August. Parsnip quality much higher on undug bed, little forking compared with more than half of dug parsnips forked and a little more canker on surface. Harvested 5.5 – 15.6, taking larger leaves only. This is a slow to flower cultivar and yields were impressive, up to 3kg weekly off both beds. There was more yellowing of lower leaves and more slug damage on the dug bed. There were 13 weekly harvests, 14.4 -14.7, in a warm spring, with the highest weekly harvest in early July (2.5kg off both beds) thanks to high temperatures (28C). 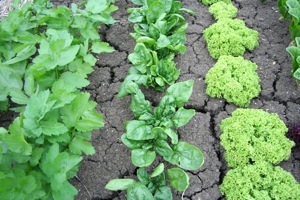 Lower yields on dug were partly due to slug damage, and leaf quality was higher on the dug bed – glossier, thicker leaves. The only leafy spring crop to perform better on the dug bed; perhaps an indication of the importance of mycorrhizae, which beets, apparently, do not use and which are damaged by digging. Harvested 31.5 – 25.6; there was some bolting by late June and plants were smothering the germinating carrots nearby (chard has hungry roots and is a bossy plant). 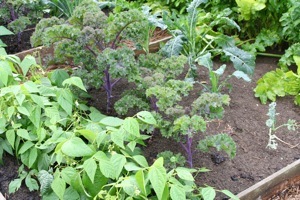 Undug potato plants were looking darker green and slightly larger by late May, with leaf curl on the dug plantsâ€™ leaves. There were more misshapen and knobby tubers from the dug bed, unlike last year, and the dug potatoes were relatively more smeared with soil. Two harvests on 3.6 and 11.6. Dug plants were a little ahead in late May, partly from less kicking of the surface soil by blackbirds, who were rummaging for worms in the compost surface of the undug bed. The harvest on 29th October revealed many lovely roots, noticeably straighter and cleaner from the undug bed (no forked roots compared to one half forked on dug bed), but the dug roots were broader shouldered. Most of the roots were forked and short, harvested 10.9. Harvested 2 – 19.11, fair quality but a poor variety with too much leaf. 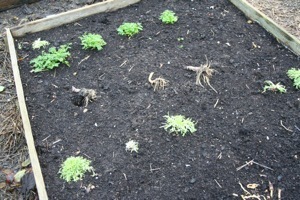 Roots were pulled in early November, by which time there was a fair amount of slug and carrot fly damage in both beds. The dug roots were shorter but more numerous from better germination. 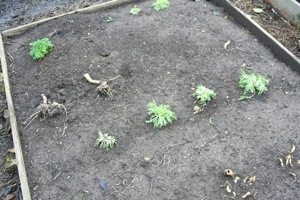 I think that woodlice nibbled many tiny leaves on the undug bed’s emerging seedlings in late June and early July. Dug peas were ahead in late May and grew slightly more strongly throughout. Harvesting started and finished earlier than usual, between 18th June and 15th July. 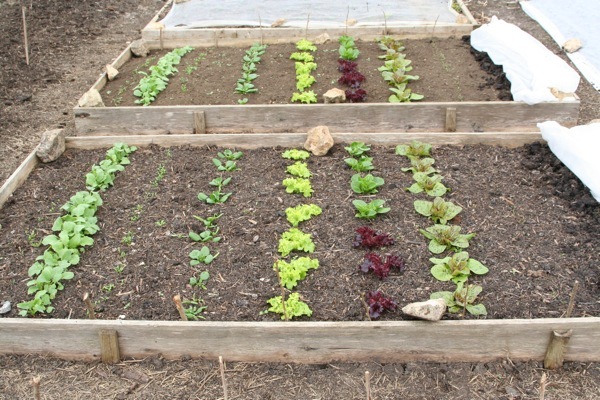 Each bed yielded about 1kg weekly every three days from 25.6 – 13.7. Harvests from 4th to 17th June were mostly similar. 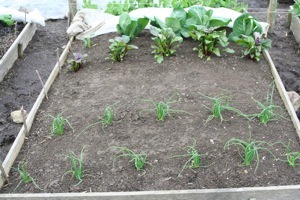 Larger roots were carefully twisted out on the first two harvests, before clearing the bed so as to plant leeks. The whole row of undug carrots was eaten by slugs or woodlice and kicked around by blackbirds looking for worms in the rather strawy horse manure. I decided to plant celeriac instead and to do a similar celeriac/carrot cropping, but with celeriac on dug and carrots on undug, on beds 1 and 2. The carrot harvest was from 17.6 to 6.7, roots were rather stumpy and with some slug damage. Growth was good in a wet summer but this is a poor cultivar from Seeds of Italy, with disproportionately abundant leaf growth and relatively small roots. Harvested in November. 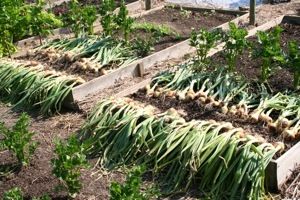 By late May there was a massive difference in growth, with the dug onions much smaller and paler, and the undug onions remained darker and stronger until they were all pulled on 4th August. Bulbs were trimmed and weighed on 11 August, then left to finish drying in a crate in a barn. Turnip Manchester Market 5.8, one row direct sown after peas. Germination was a little better on the dug bed and these plants grew more strongly, all roots were harvested on 15th November. There were lovely hearts in mid October, but I harvested them in November when leaves were scarcer and more valuable – as a result, many leaves had to be trimmed off because of rotting and slug damage. 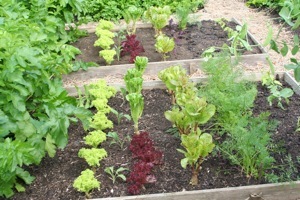 Plants on the undug bed looked healthier throughout with slightly larger and glossier leaves. Growth of the undug leeks was stronger, with darker green leaves, but there were 9 bolting leeks on this bed by the end, compared to two on the dug bed. Bolting stems and most of the flag were removed before weighing, harvests from 8.9 – 19.11. Germination and growth was better on the dug bed. 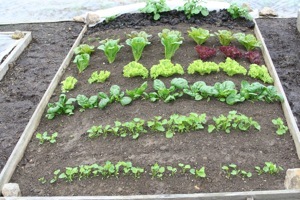 Small harvests in October and November of outer leaves.